Let them eat cake! Time to revisit my flourless chocolate cake recipe created for my husband who cannot tolerate even a whiff of wheat. 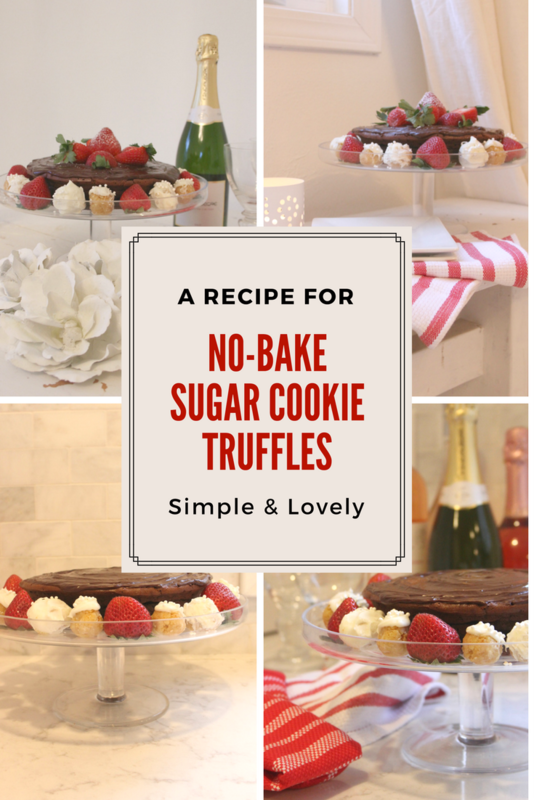 And what the heck – here’s my sugar cookie truffle recipe as well. Holiday Desserts Without Gluten. Easy Gluten-Free Baking Ideas. Hello Lovely Studio. 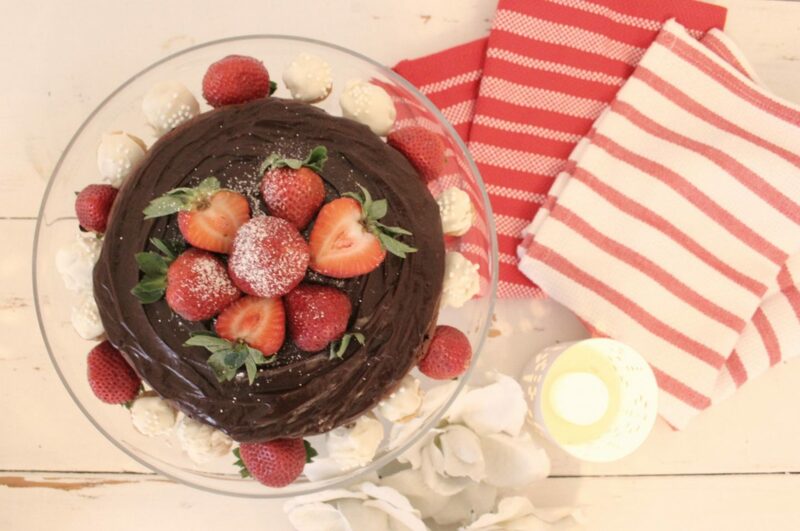 Flourless Chocolate Cake is high in protein and requires only a few ingredients. 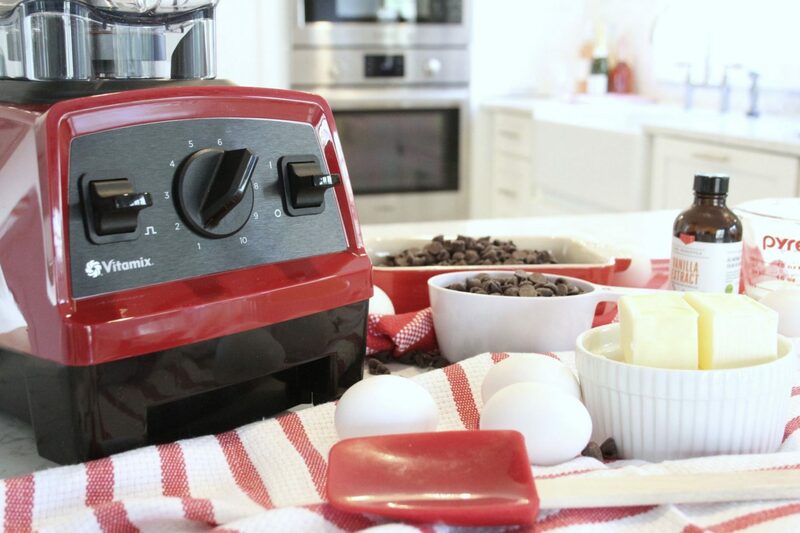 Since the key to the recipe is properly blending the eggs uber-fluffy, Vitamix provides the power for the task. Ever use a blender for your batters? 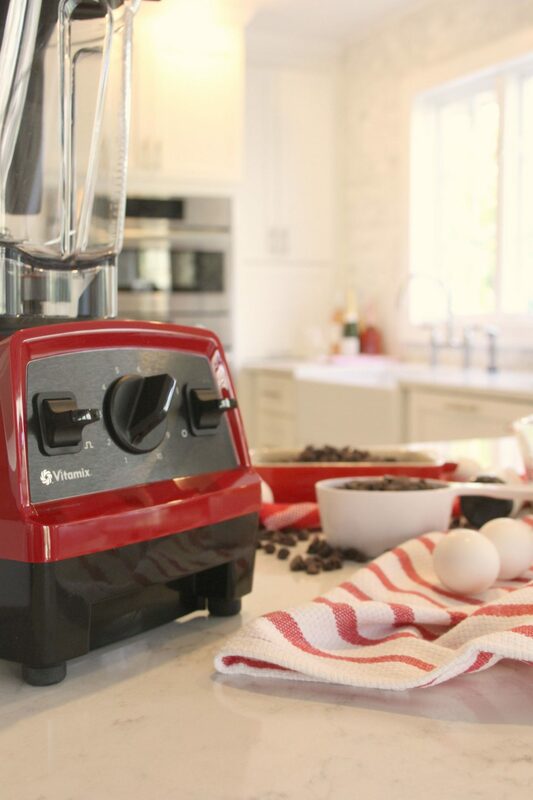 Vitamix Explorian E320 minimizes the effort and mess while it maximizes the joy of creating a professional looking gluten-free, flourless chocolate cake. 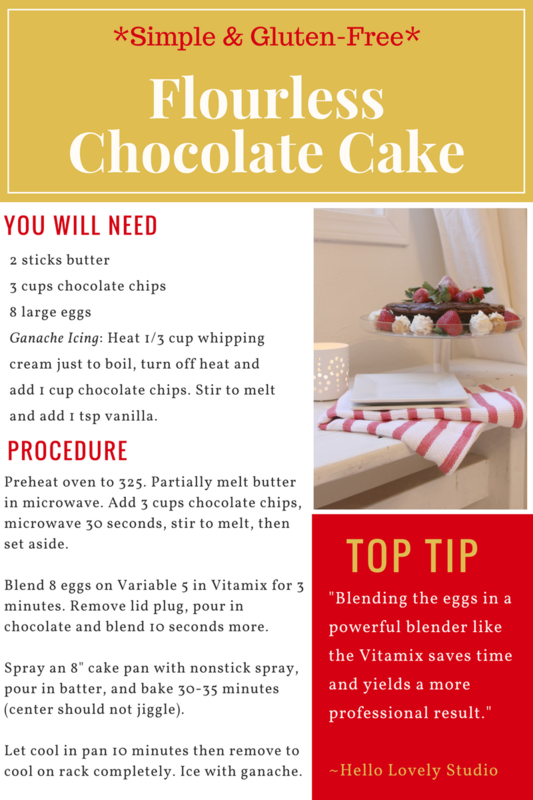 How to Make Flourless Chocolate Cake (Gluten Free) – Buy This Vitamix here or HERE. Holiday Desserts Without Gluten. Easy Gluten-Free Baking Ideas. Hello Lovely Studio. 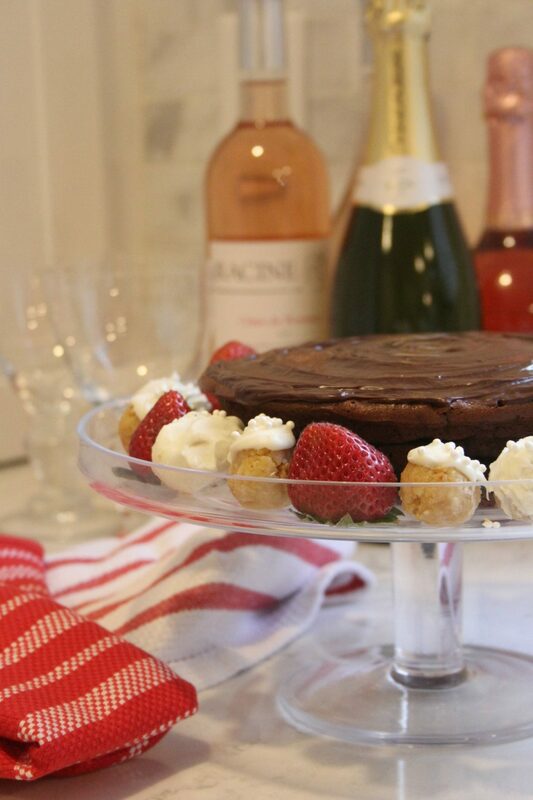 How does this homemade flourless cake compare to a chocolate cake made with flour? The texture of this cake is more dense and resembles a fudgy cheesecake. However, with no added sugar, it doesn’t taste too sweet. 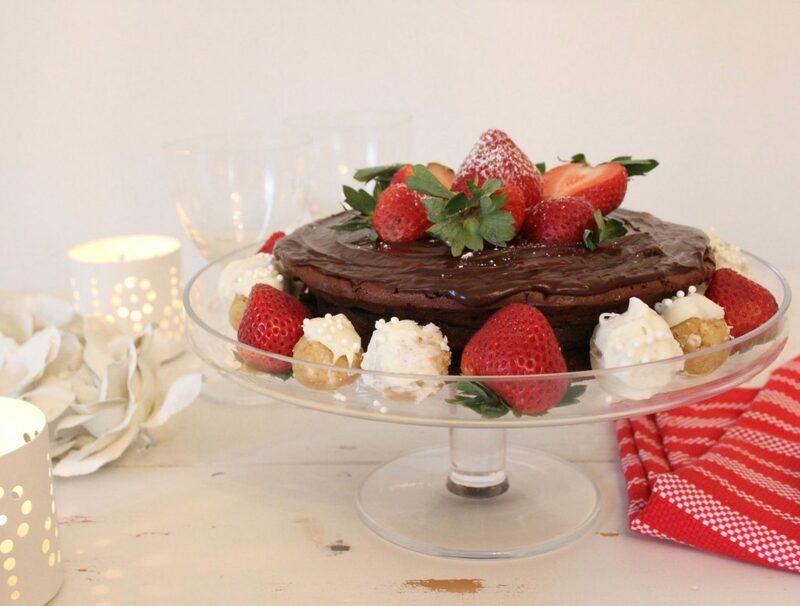 Should you be a sweet tooth who needs their chocolate cake rich-von-rich, you can double the ganache recipe or drown the cake in chocolate sauce. 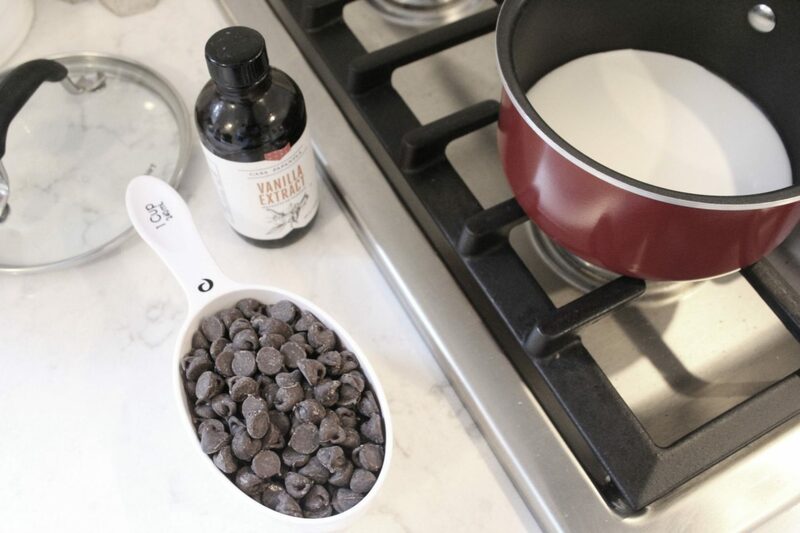 You could also certainly add some rum to the batter or ganache. So many ways to make this recipe your own! I decorated mine with fresh strawberries, powdered sugar, and g-free sugar cookie truffles (recipe below). The cake can be dressed up to serve for holidays and special occasions or served undecorated any day of the week. Preheat oven to 325. 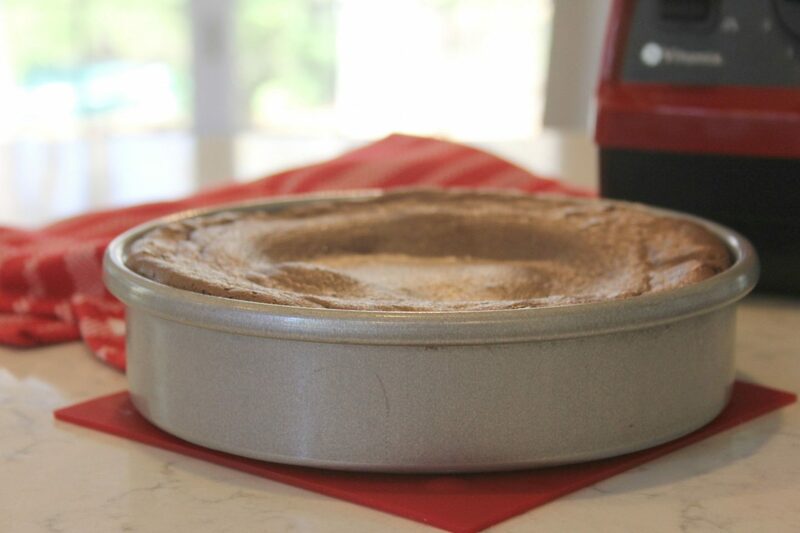 Spray an 8″ round cake pan with non-stick spray. 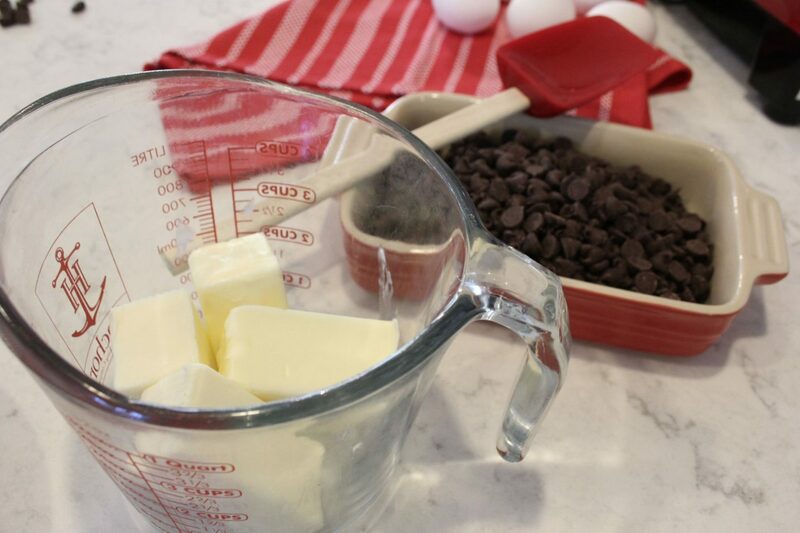 Partially melt butter in microwave, add chocolate chips, heat in microwave 30 seconds more, then stir to melt and combine. Set aside. 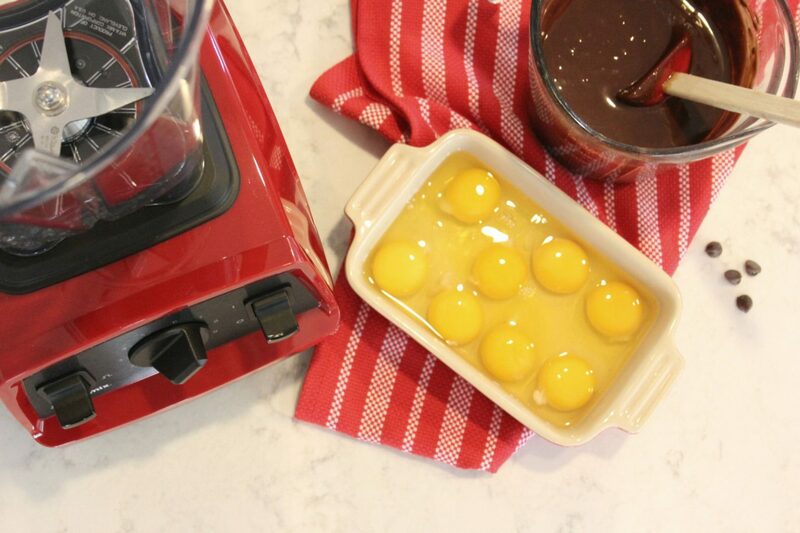 Blend the eggs at Variable 5 of the Vitamix for 3 minutes. Remove the lid plug and add chocolate mixture, blending a few seconds more. Pour the batter into prepared pan and bake in center of oven for 30-35 minutes. It’s done when there’s no jiggle factor in center or bottom. It will rise above pan and then settle as it cools. 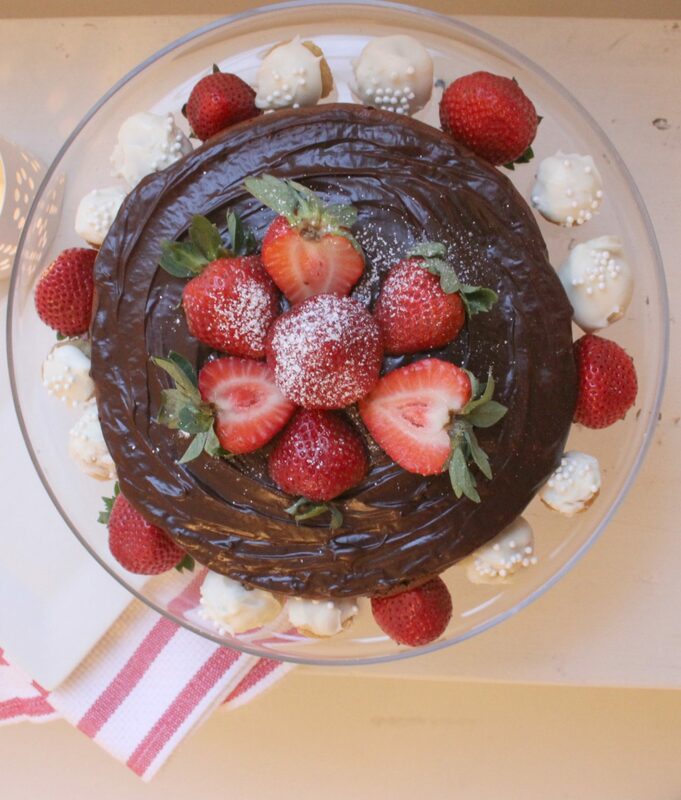 Flourless Chocolate Cake Recipe. Holiday Desserts Without Gluten. Easy Gluten-Free Baking Ideas. Hello Lovely Studio. 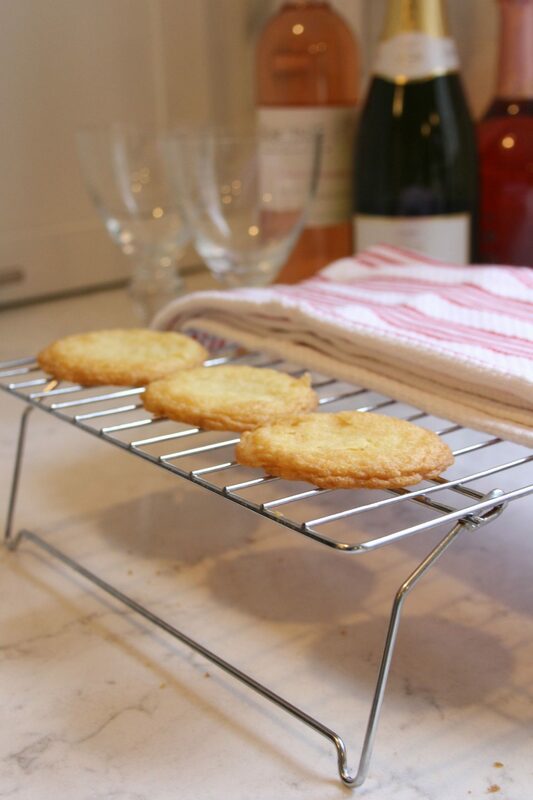 Cool in pan 10 minutes then remove and cool completely on wire rack. 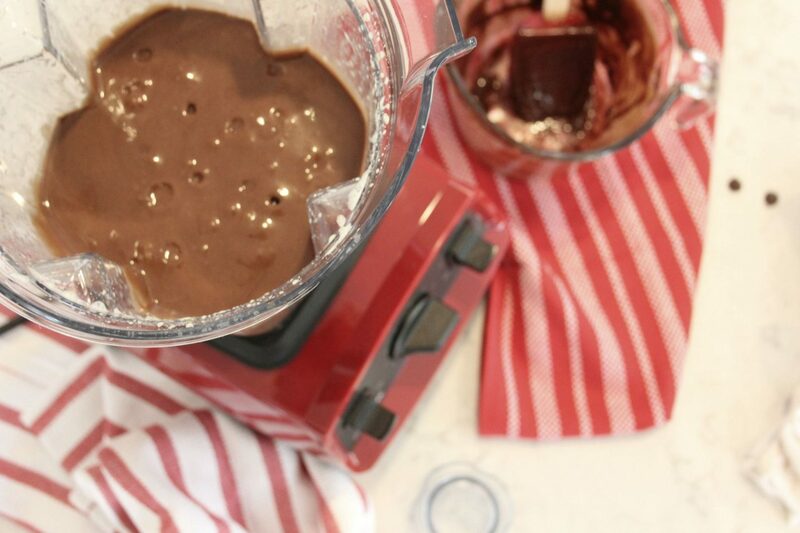 When cool, make ganache icing. 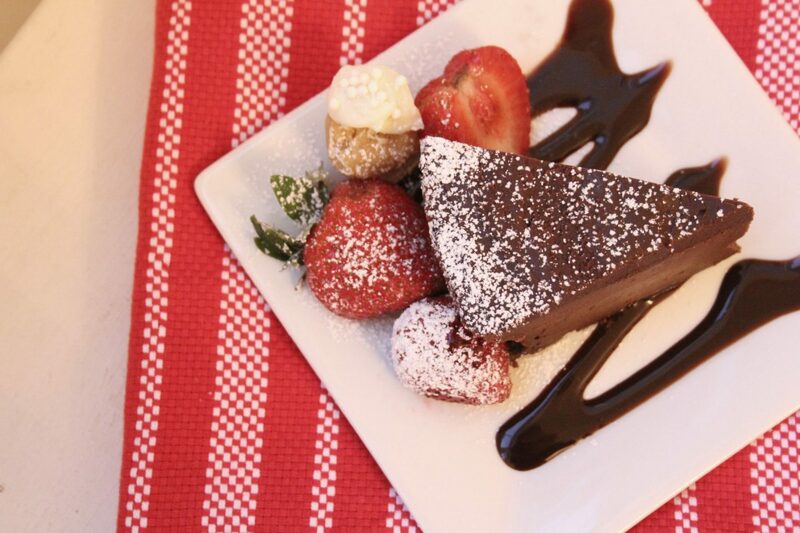 Recipe for Flourless Chocolate Cake. Holiday Desserts Without Gluten. Easy Gluten-Free Baking Ideas. Hello Lovely Studio. In small saucepan, heat whipping cream just til it begins to boil. 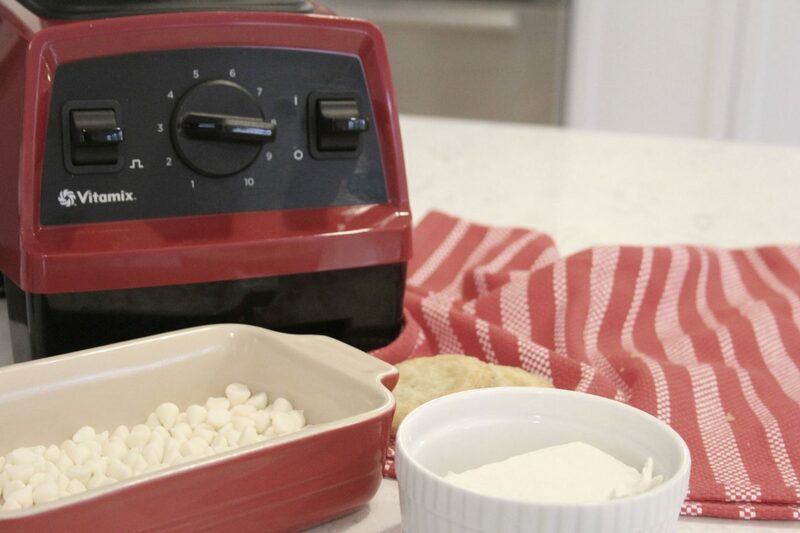 Remove from heat and stir in chips and vanilla until smooth. Ingredients for Ganache Icing. Holiday Desserts Without Gluten. Easy Gluten-Free Baking Ideas. Hello Lovely Studio. 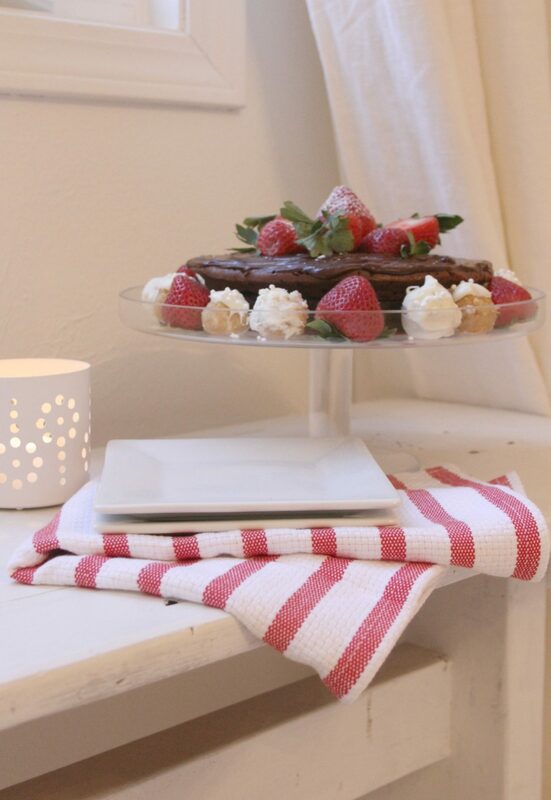 Transfer cake from rack to a plate. 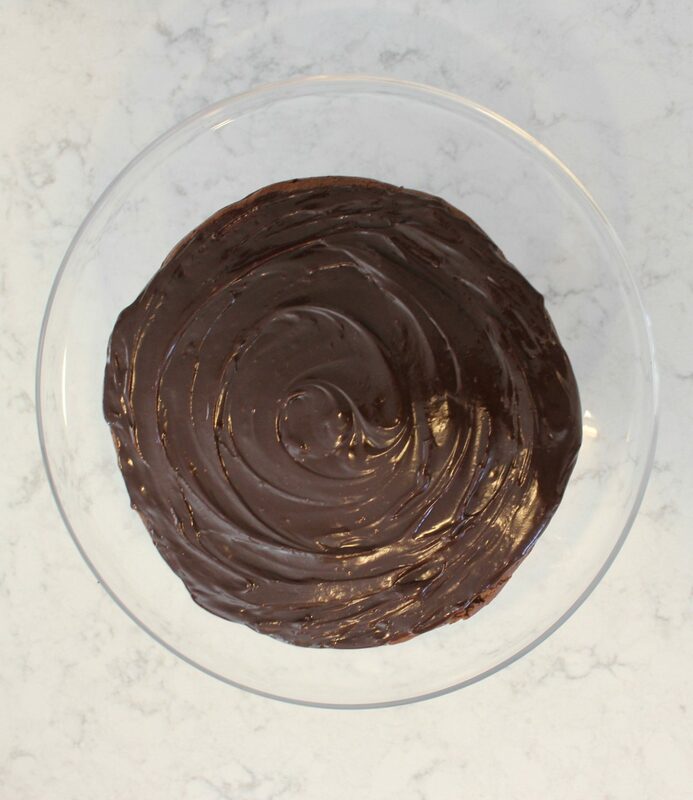 Pour the ganache on top and spread with spatula. Flourless Chocolate Cake with Ganache Icing. Holiday Desserts Without Gluten. Easy Gluten-Free Baking Ideas. Hello Lovely Studio. The sides of my cake were not the loveliest, so I opted to decorate the cake with a ring of alternating strawberries and sugar cookie truffles (gluten free!). Flourless Chocolate Cake. Holiday Desserts Without Gluten. Easy Gluten-Free Baking Ideas. Hello Lovely Studio. Then I added a few sliced berries and whole berries to the top of the cake. 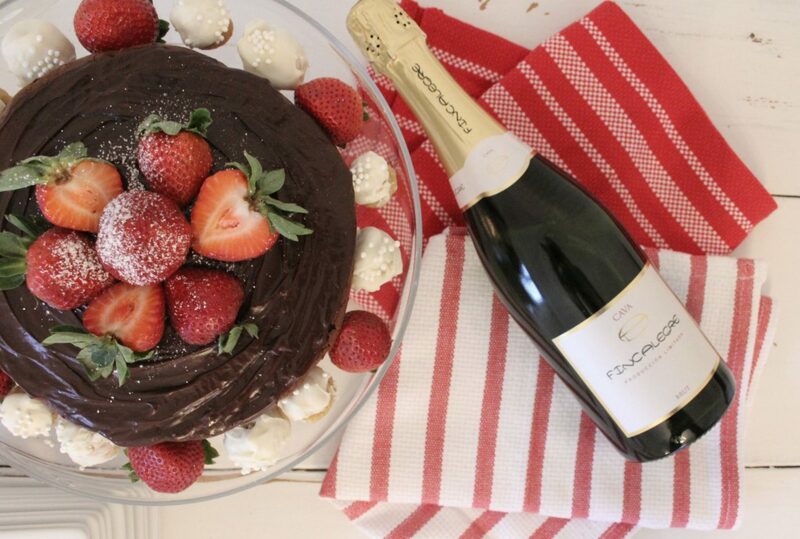 How to Make Flourless Chocolate Cake. Holiday Desserts Without Gluten. Easy Gluten-Free Baking Ideas. Hello Lovely Studio. 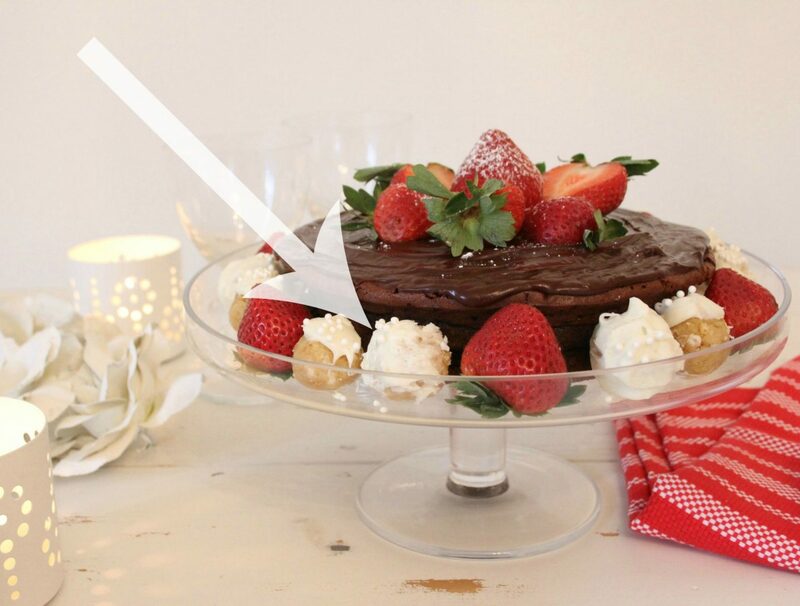 How to Make Flourless Chocolate Cake (Gluten Free). Holiday Desserts Without Gluten. Easy Gluten-Free Baking Ideas. Hello Lovely Studio. Because one can never have too many pictures of their children or cake. Holiday Desserts Without Gluten. Easy Gluten-Free Baking Ideas. Hello Lovely Studio. 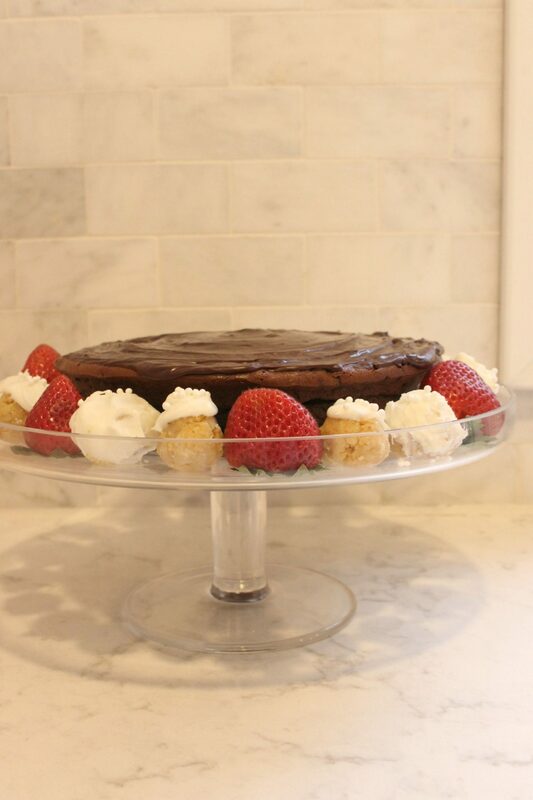 Flourless Chocolate Cake (Gluten Free). Holiday Desserts Without Gluten. Easy Gluten-Free Baking Ideas. Hello Lovely Studio. It only looks hard to make! Holiday Desserts Without Gluten. Easy Gluten-Free Baking Ideas. Hello Lovely Studio. 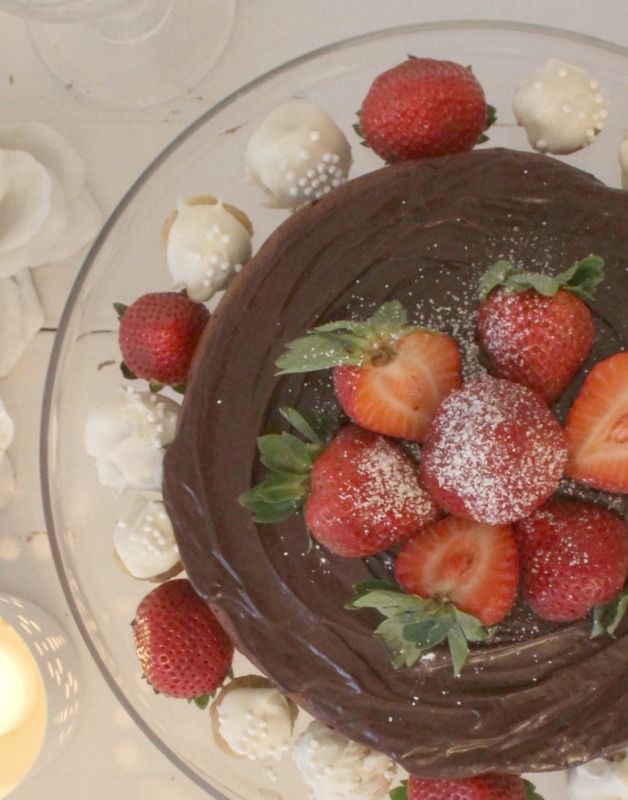 Flourless Chocolate Cake with Berries and Sugar Cookie Truffles. Holiday Desserts Without Gluten. Easy Gluten-Free Baking Ideas. Hello Lovely Studio. 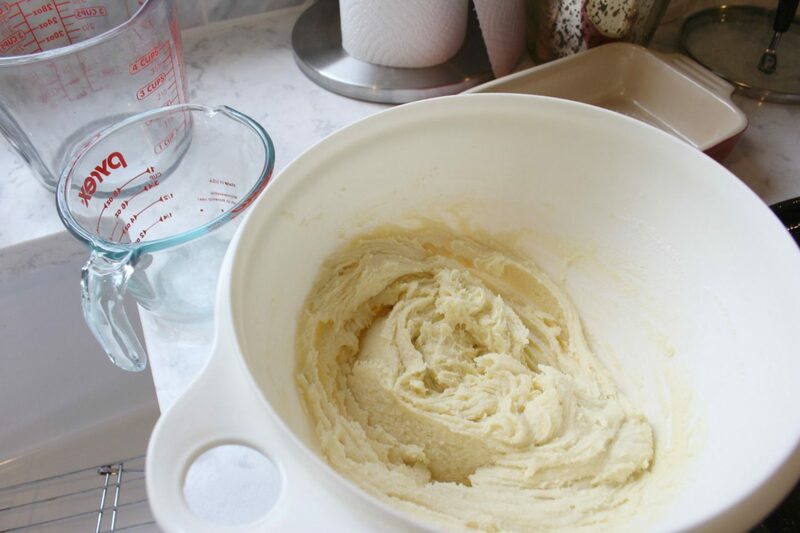 Vitamix for baking? Hello, Lovely! The cake was a hit with my husband, and he also loved the sugar cookie truffles (those delicious morsels above resembling donut holes) for which I relied upon the Vitamix E320. 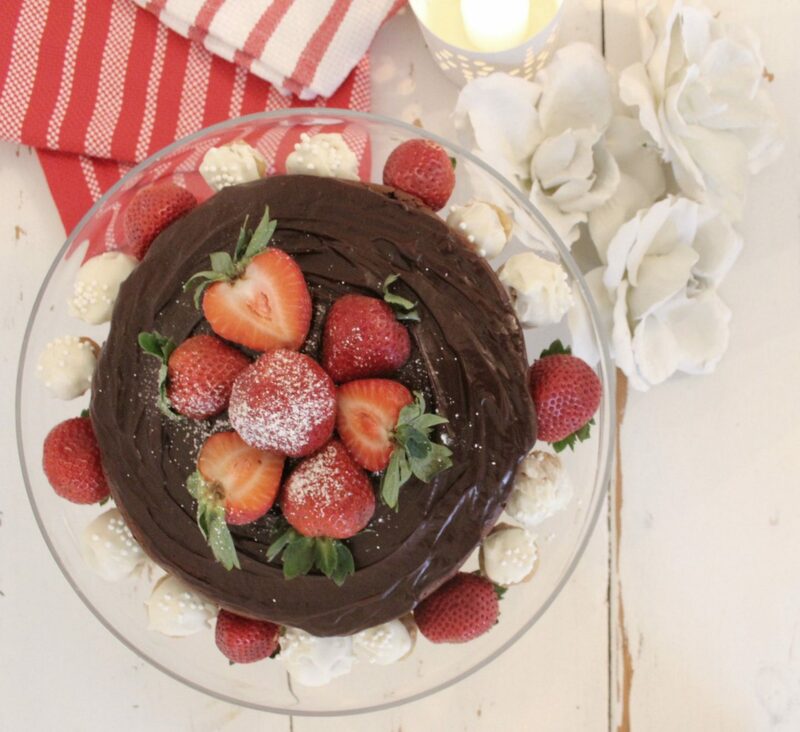 NO-BAKE SUGAR COOKIE TRUFFLES were used along with berries to decorate the sides of my Flourless Chocolate Cake. Sugar cookie truffles are great on their own or as an addition to your Thanksgiving sweets spread and Holiday cookies. 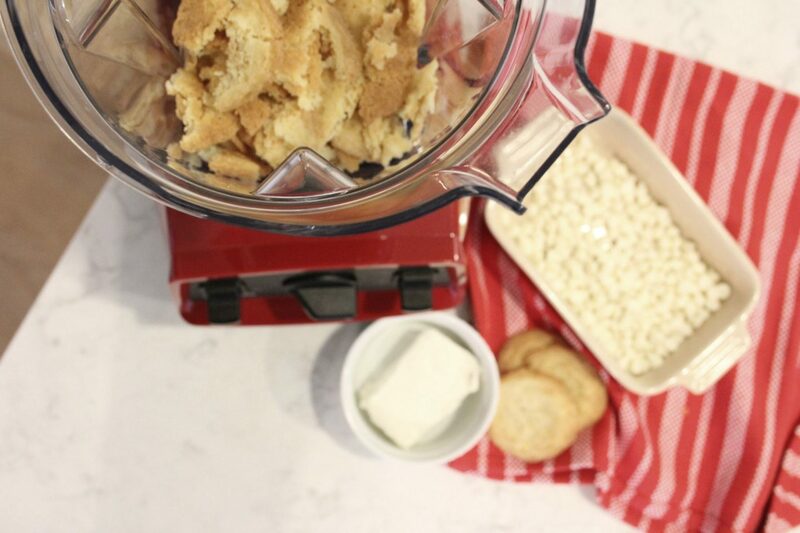 I started with homemade, gluten-free sugar cookies (I substituted gluten free flour for regular flour in my recipe here), but you can certainly make it easier on yourself and opt for store bought cookies for this no-bake recipe. My Vitamix Explorian deconstructed the cookies and transformed them into the perfect crumbs. How to Make Sugar Cookie Truffles. Holiday Desserts Without Gluten. Easy Gluten-Free Baking Ideas. Hello Lovely Studio. How to Make Sugar Cookie Truffles; Vitamix Explorian. Holiday Desserts Without Gluten. Easy Gluten-Free Baking Ideas. Hello Lovely Studio. The unglazed cake really does resemble a cheesecake. I’ll have to try this! No problem with gluten, but yummy is yummy! If you want a less dense ganache, you can beat it. Same recipe, but whipped, and it goes from dense to fluffy. Thank you, lovely one! 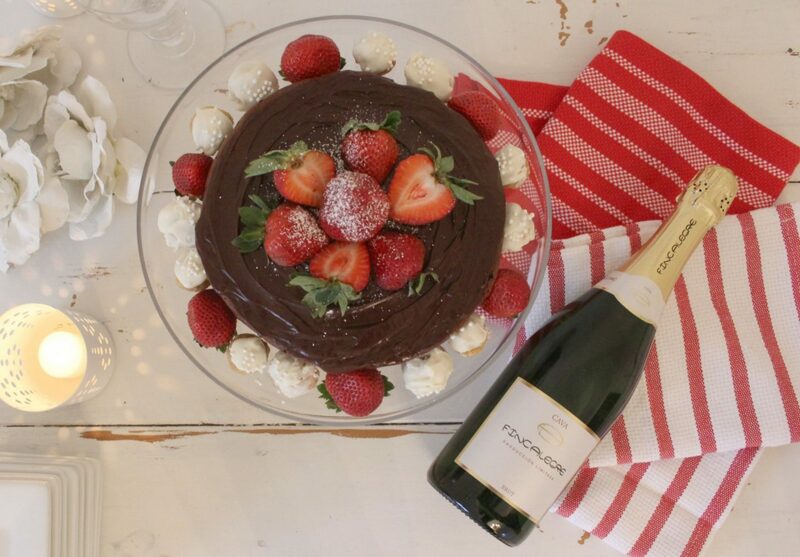 I would eat a chocolate cheesecake over this any day – this cake is not very sweet and not as rich as it appears. And if I can tolerate gluten and am eating cake, I want rich!